In addition to using Lumira Discovery, I finally joined Stephanie Evergreen’s Data Visualization Academy. I was on a waiting list – not for sure how long, and then the other week I received the email that I could join. I am at “Ninja level 1” in the academy. So I thought I would put what I learned using Lumira Discovery and our ASUG BI webcast statistics as of September 30th. This also helps as we are conducting survey to plan for 2018 (please take the survey, we will provide random prizes). Stephanie says “default colors cause confusion and make you look like you are well, default..”. Okay, I am guilty of this, so I am trying to fix that now. 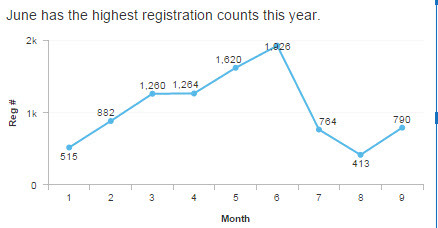 Above is online registration by our Special Interest Group, with our Analytics SIG having the highest. Stephanie said we need to write a complete sentence in the title, with a period. I don’t think the images are showing as nicely as they could on this site. 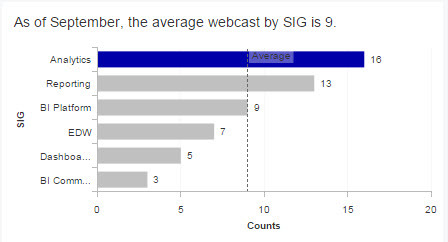 Our average webcast by SIG IS shown above, with Analytics being the highest. 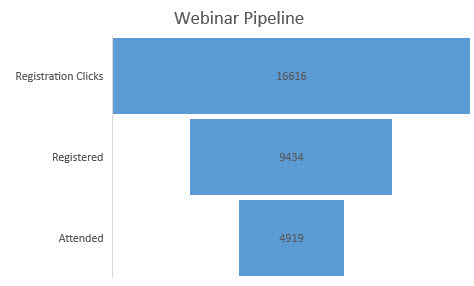 SAP speakers have provided the most webcasts so far this year with 32 webcasts given. This is interesting as preliminary feedback on our survey shows that “we offer too much customer content”. 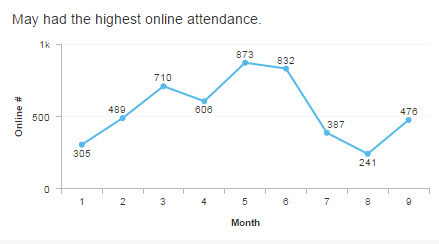 May had the highest online attendance, which is interesting as that is the same month as ASUG Annual Conference/SAPPHIRENOW, and we do not hold any webcasts on conference week. More high level stats are shown above. We are lower than previous years, but I am hoping the next few months we will see more attendance. So 16,616 clicks with 9,434 registered and 4,919 attending; that is a 52% online attendance rate; I think the industry average is 40%. The key (if I could drill down into the data) is to learn how to convert the clicks into registrations and better attendance. Take our survey today – what would you like to hear more from ASUG in 2018?